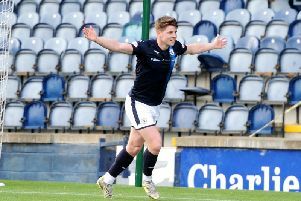 The 23-year-old has featured in central midfield, out wide, and even at full back since making his first team breakthrough under Grant Murray at the end of season 2014-15. His versatility has been an asset to the team, but perhaps not so much to Matthews himself as he looks to nail down a regular place in his preferred position in the middle of the park. He is mostly known for his defensive attributes, however, that may soon change after an impressive display in a more attacking midfield position, and scoring his third goal of the season, in Saturday’s 4-1 win over Dumbarton. “That role suited my game,” Matthews explained. “Because Nat (Wedderburn) was sitting it allowed me to make forward runs and I enjoyed that. “I like playing anywhere in the centre but normally I’m the one that has been sitting doing Nat’s role. “But I enjoyed it, especially as I felt like I could run off their midfield, and because I’m fit, it allowed me to get box-to-box. “I felt I was fitter and quicker than them, and it was the same with Jamie Barjonas on the other side. “I thought he ran off them really well and the system suited us. Before Saturday, Matthews had only started one of the previous 12 games since being substituted at half-time in the home defeat to East Fife at the end of December. But he is hopeful that Saturday’s performance will help reestablish his place in the side. “Personally, I had a poor game against East Fife and I’ve struggled to get back in the team since then,” he said. “But I’m not the type to go away, get frustrated and give up. “I’ve been working hard and hopefully I’ll take the chance and keep my place in the team. Matthews was particulary pleased to have played his part in one of the team’s most convincing performances of the season against a Dumbarton side that had been in excellent form. “The lads needed that,” he said. Matthews is now determined to take three points from Bayview this Saturday and end this season’s winless record against derby rivals East Fife. “We’ve not had a good record against them and everyone in the changing room is really keen to go there and prove a point,” he said.